The annual hop harvest for Cascade Brewery Co’s officially gets under way today (Wednesday, 14th March) with the picking of the hops as part of the brewing process for the 2012 Cascade First Harvest vintage ale release, to be led for the very first time by Head Brewer, Mike Unsworth. As the name implies, First Harvest is crafted with the first harvest of Tasmanian barley and hops of the season, making it renowned for its noteworthy intensity, balance and a unique fresh hop character. The hops for the 2012 Cascade First Harvest ale will be hand-harvested today at the well-known Bushy Park Estates in the stunning Derwent Valley, north of Hobart, and the limited release brew will be available to beer lovers in early May. This year’s three experimental hop varieties which have never been used in brewing before are Campania (bitterness hop), Triabunna (flavour hop) and Ellendale (aroma hop). All have been named after historical hop growing areas in Tasmania, where hops were produced for local beer production throughout the 19th century. 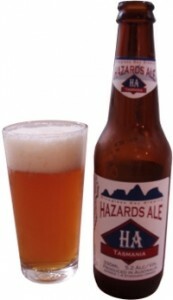 The limited release ale was the first beer of its kind to be produced in Australia, brewed using exclusively fresh, green handpicked hops and was the first beer to commit to using experimental hops each year, thus leading the charge for the development of new hop varieties in Australia. Cascade First Harvest is made in a single batch and historically sells out before the full snap of winter sets in with only 3,600 cases available for sale. A testament to the Cascade team’s labour intensive, time dependent and hand-crafted brewing philosophy, the result is the creation of a beer that is truly unique. Head brewer at Cascade, Mike Unsworth is eager and excited to begin the creation of his first Cascade First Harvest release. “A highlight every year for Cascade, I’m really excited to be brewing my first vintage of First Harvest and continuing the tradition of giving our fans a beer that is so distinctive,” said Unsworth ahead of today’s hop picking. “Based on this year’s hop selection and the traditional style of First Harvest, we anticipate the 2012 brew to exhibit aromas and flavours of peeled fruits and blackberries over nettles, green leaves and ground spices. The finish should deliver a resinous bitterness which should blend in with the malt base to give a well-balanced hoppy beer,” Unsworth continued. The 11th anniversary release of Cascade First Harvest will be available for a limited time only in 4 packs of 375ml bottles with a RRP: $19.99 from the first week of May at selected retailers nationally including Dan Murphy’s, First Choice and Vintage Cellars. Campania is situated in the Coal River Valley, an area more associated with wine but originally settled to mine the local coal. The valley was used as grazing land and for pastureland, including the growing of hops which was supplied to the early breweries around Hobart in the 1820s and 1830s. Triabunna is situated on the East Coast, an area where hops were produced successfully in the late 1800’s with mild, sunny summers producing good crops. Hops were grown here on a small scale, manually picked and dried in small timber and brick kilns and supplied to local beer producers. Ellendale is located in the upper reaches of the Derwent Valley, above the larger hop growing areas in the region. 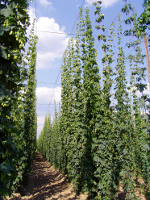 Hop growing increased in popularity here from the 1870s with 42 growers being listed by 1910. Hop kilns of various sizes have been built in this area, some of which are still standing today. The weather in Sydney of late has been cold and wet to say the least, signalling the time to switch from those easy drinking lagers and light ales that embody summer to the stouts and porters that bring warmth to the cold of winter. Iron House Paddys Head Stout covers the need nicely dark black and hailing from down South in Tasmania, where we assume they know a thing or two about staying warm in the cold. The Iron House Stout poured from a bottle into a glass with a small tan coloured head, a low level of carbonation and a dark black body. The nose is a real highlight on this brew with plenty of different aromas to intrigue the stand outs being licorice, roasted coffee, cooking chocolate and a hint of vanilla. On the palate this brew is not lacking in the flavour department chocolate, burnt toast, macadamia nuts, coffee, brown sugar and pepper were very easy to pick up. Considering the amount of flavours present I was extremely surprised how clean this beer ends, not much is left after swallowing except for a moderately sweet caramel aftertaste. This is not a beer that works when overly cold as some of the flavours come through very one sided and harsh. But its not the sort of style you tend to rush anyhow, allowed to warm the taste becomes alot more rounded and the more subtle flavours really shine. Verdict: A lovely Winter Stout this is a great brew to unwind with after a cold wet Winters day, I am definitely keen to get my hands on some more. Where to buy:Seems Iron House beers don’t make it too far North from their home in Tassie, luckily they can be purchased online from the “Taste of Tassie” website. Its hard not to like the thinking behind Two Metres Tall company, they grow beer ingredients on their farm and turn them into beer. Sounds pretty simple, is there a better way to taste a micro climate than through a beer? Although i don’t think many brewers have done it this way since the early 20th century so i have to give these guys full kudos for bringing it back into style. Decanting a bottle of their Cleansing Ale into a glass is an experience in itself, it pours golden amber in colour, with a large creamy tightly packed white head riding atop. Aroma wise tropical fruit, toffee and pine notes predominated although the odd hint of citrus was easily noticed. On the palate malt notes lead then build to a variety of “fruity” flavours ( mango, apple, orange, lemon and lime were the main offenders) along with pine, toward the back of the palate malt notes seem to take over again with caramel and toffee flavours. The malt notes then died down in the finish leaving a gentle tang and a slight sudsy mouth feel. Verdict: Very drinkable, the fruitiness and pine makes it a great starter for a hot day even with so much going on taste wise. Porters Liquor at Northwood stocks it, or you can contact the Two Metre guys and organise delivery via mail.